Screwdrivers are one of the mankind’s most useful tools and it’s easy to see why. While their main function remains roughly the same, all kinds of trades and tasks require can be achieved with the right screwdriver. House owners, jewelers, construction workers, optometrists and more. They all need screwdrivers to complete successfully their tasks which are why there are so many different screwdriver sets out there, and this short guide will tell you exactly what you need to know about them. There are as many types of screwdriver﻿ sets as there are uses for them which mean you’ll be able to find sets for just about any task. Regardless of how different one set can be to another, all of them can be divided into two categories. Those that come with screwdrivers, also known as handheld screwdriver sets: and those that only have tips, known as screwdriver bit sets. These sets are made out of screwdrivers of different sizes and tips. You’ll find them for household work, jewelry work, construction work and more. The sets will often come in advertised as such and will include the screwdrivers needed for a certain task. As the name implies, this set doesn’t have screwdrivers but rather different heads that you can exchange. These sets are made for power screwdrivers and offer a wider variety of possibilities than the standard one. Of course, they’re only convenient if you already own a power screwdriver. The main objective of this kind of set is to handle as many applications as possible. These sets are better suited for home or for places that don’t require professional grade screwdrivers. You’ll find them both as handheld screwdriver sets or screwdriver bits sets, but the objective is always the same: Give the owner tools to tackle as many different tasks without necessarily worrying about precision work. Because of this, these sets are usually the most affordable. As the name implies, these are specialized sets created for very specific tasks. You’ll find sets for computer repair, optometrist work, jewelers, watch repair and more. Each kit has screwdrivers specifically designed to work with small screws and is designed to make handling minuscule pieces much easier. 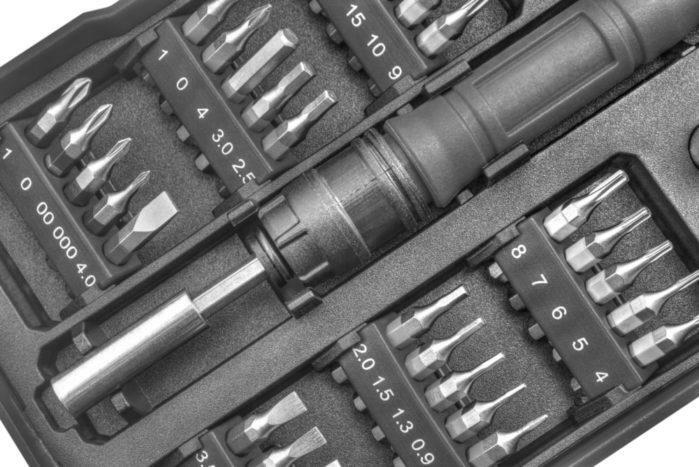 These usually include the strongest screwdrivers out of any set, as they’re created for heavy duty applications, such as to work with cars or in industrial settings. While similar to the mechanic sets in the sense that they’re both built to withstand very rough treatment, these sets are used almost exclusively for construction purposes. While each set is made with certain tasks in mind, you’re more than welcome to use whichever kind suits your fancy. After all, a construction set might help you with housework as much as a general set would and the same can be said for mechanic sets. The only sets we advise you to avoid buying without proper research first are precision sets, as their specifications might not meet your needs. Do you have any questions? Is there something we forgot to add? Let us know in the comments! How to Paint Aluminum Furnishings Like a Pro!